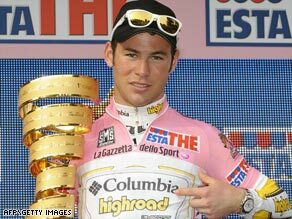 (CNN) -- Mark Cavendish became the first British rider to wear the Giro d'Italia leader's pink jersey when his Columbia team claimed victory in Saturday's opening team time trial. Cavendish sports the pink jersey after his team won the first stage of 92nd Giro d'Italia around Venice's Lido. The sprinter, who won four stages of the Tour de France last year after two in the Giro, crossed the line first to help his team set down a marker of 21 minutes 50 seconds over the 20.5 kilometer course at Venice Lido. Garmin-Slipstream, with Cavendish's countrymen David Millar and Bradley Wiggins among their ranks, had been tipped to start with as win for the second year in a row. But they came up six seconds short of Columbia. Lance Armstrong and Levi Leipheimer's Astana were another likely challenger but they had to settle for third, 13 seconds back. Danilo Di Luca's LPR Brakes squad finished fourth, clocking 22min 12sec, while there was a surprise in fifth with ISD coming in five seconds further back. Russian outfit Katusha were in sixth with Rabobank, Liquigas and Lampre separated by only four seconds in seventh, eighth and ninth, respectively. Of the main contenders for overall victory, Leipheimer is best placed, followed by Di Luca, Denis Menchov (Rabobank), Ivan Basso (Liquigas) and Damiano Cunego (Lampre). Last year's Tour de France winner, Carlos Sastre, is already 36 seconds behind Leipheimer after his Cervelo Test Team could only manage 11th. Sunday's stage is a flat 156km ride from Jesolo to Trieste.